Landing Pages are widely used by the marketers for initiating new marketing campaigns by promoting and selling various products and services like eBooks, applications etc. These landing pages also referred to as sales pages, are primarily designed to convert visitors into potential customers within a matter of few clicks. 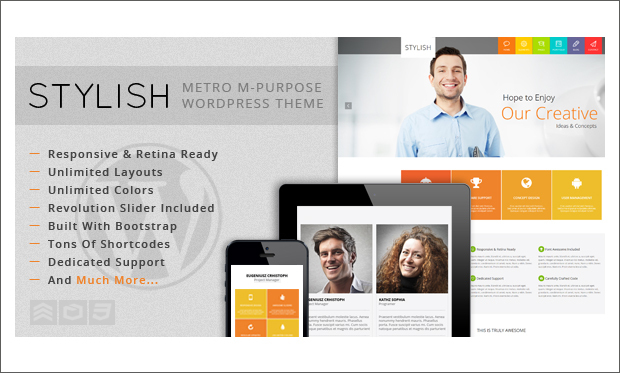 All these responsive WordPress themes are mobile-friendly and compatible with popular web browsers. They feature an eye-catching design to present your advertisements efficiently, thus boosting up your sales revenue. 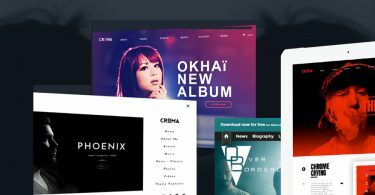 Here are the 40 Best Responsive WordPress Landing Page Themes that you can use for your website. Landy is the landing page wordpress theme with many excellent features that help in easy designing of a website that not only looks beautiful but also is fully functional and also facilitates in creation of multiple landing pages. 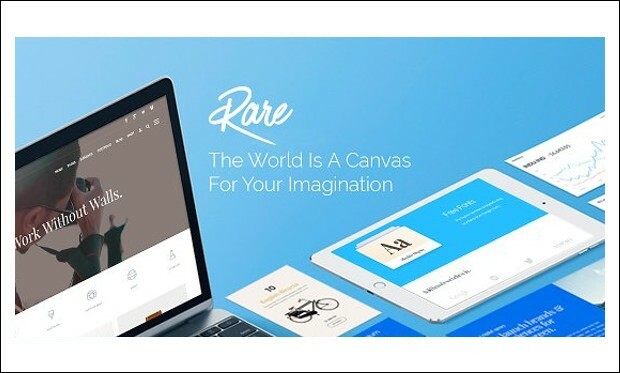 Rare is the clean and multipurpose wordpress theme for creation of multiple landing pages. It has tons of features which help in the easy creation of the website without coding languages and make it run up within minutes. 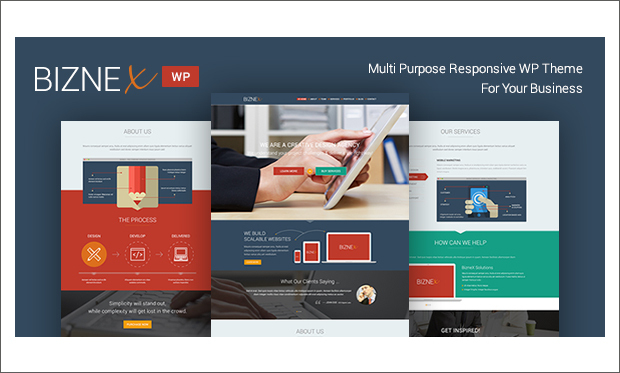 Arin is the professional and multipurpose landing page wordpress theme that has many advanced features. It has many advanced and modern features for creating the websites for business, corporate, creative agency, blog or personal websites. 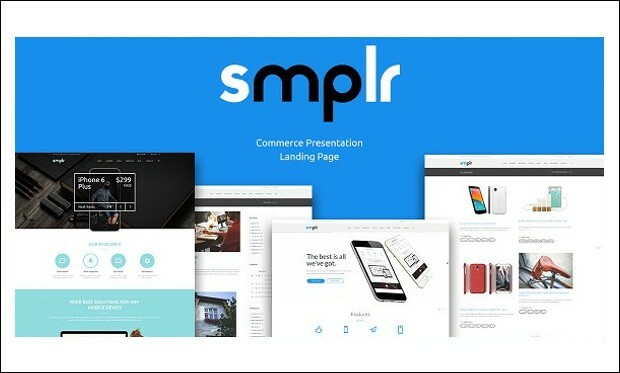 Smplr is the creative landing page wordpress theme with many advanced features that helps in creating responsive, retina ready and touch optimized websites. It has the perfect theme for creating these websites. 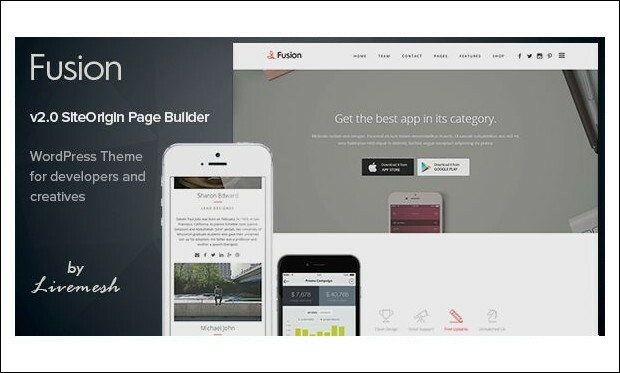 Fusion is the effective and minimal wordpress app landing page and portfolio theme to meet all the needs of a mobile app developers, creative design agency or similar businesses. It has many useful and effective features that help in the easy creation of website. 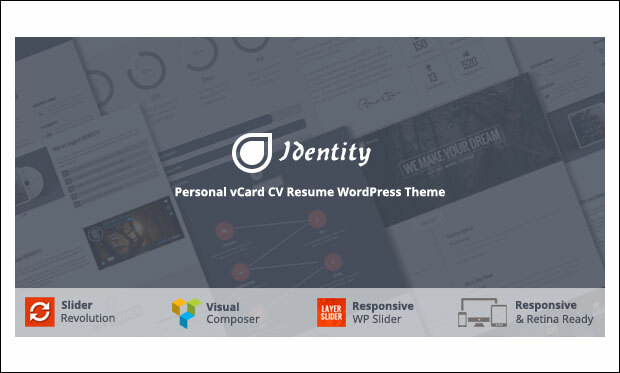 Identity is a modern vCard CV portfolio WordPress theme well suited for creating service landing pages. It includes visual composer for creating unique web pages without any coding knowledge. You can build stunning slides with 2D and 3D transition effects using revolution slider. This theme works well on major browsers such as Google Chrome, Firefox, Safari, Opera and Internet Explorer. 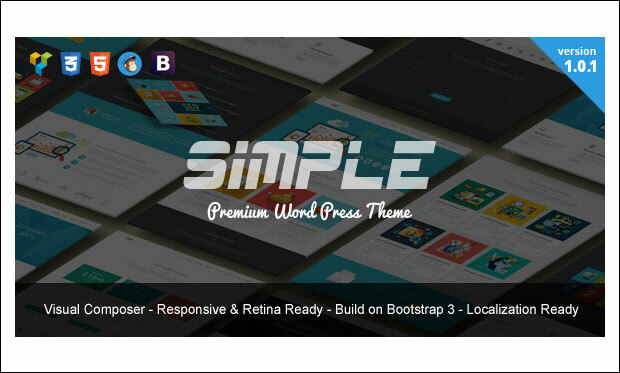 Simple is landing one page WordPress theme that is based on bootstrap 3 framework. You can easily setup the theme by importing the XML demo content file within a matter of few minutes. It includes basic child theme, powerful admin options, CSS3 animations, Google analytics field and image resizing. This theme is search engine optimized and compatible with popular SEO plugins like SEO Yoast and All in One SEO. 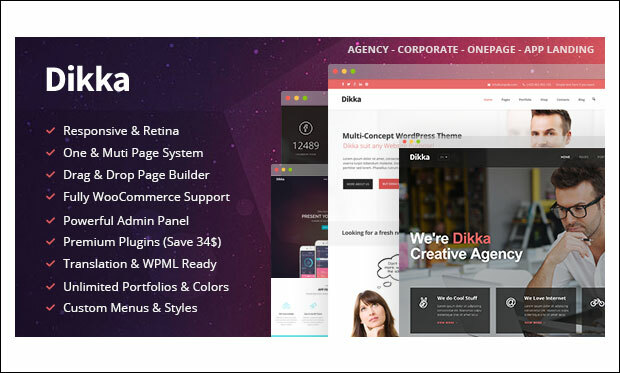 Dikka is based on twitter bootstrap framework that can be used for creating app landing page sites. Give your site a unique look and feel by using unlimited colour options, 600+ Google web fonts, typography options and video background sections. Impress your visitors by adding stunning images or videos via slider. It is translation ready and compatible with major browsers out there. 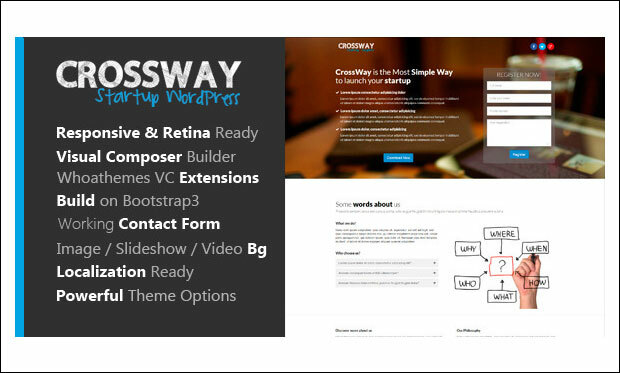 CrossWay is a 2 in 1 startup landing page WordPress theme that can be used as one page and multipage theme. This theme is built on the popular front end bootstrap 3 framework. It includes working contact form and Mailchimp subscribe form to establish interaction between website owners and visitors. You can create your own custom skins and choose from unlimited colours, layouts and fonts. 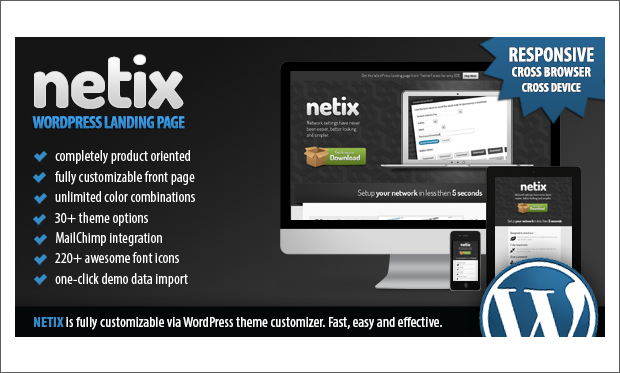 It’s an amazing app landing page WordPress theme that can be easily installed and setup at a reasonable price. 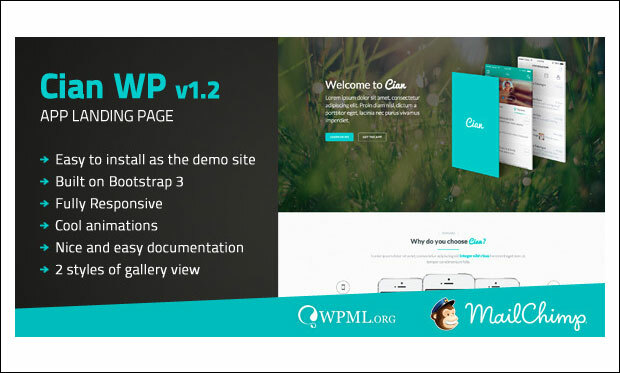 Cian is compatible with bootstrap 3 framework and comes integrated with Mailchimp. It includes demo XML files for easy customization of the website. Cian theme features rotating twitter feed, PSD mockups, fullscreen parallax background, fullscreen image slider and video backgrounds. 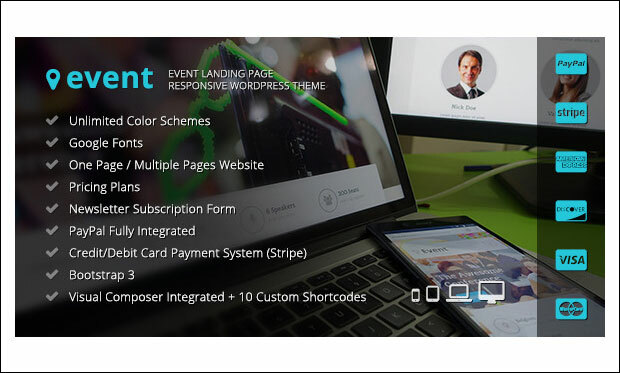 Based on bootstrap 3 framework, this landing page WordPress theme is suitable for creating concert, exhibition, events and conference websites. You can easily accept payments as this theme comes integrated with PayPal payment gateway and Stripe credit or debit card payment system. Design your site by choosing from unlimited colours, font awesome icons and unlimited Google fonts. It’s a clean and beautiful landing page WordPress theme designed for portfolio, photo studio, freelancers or creative agencies to help them build their owns site in less time. This theme is based on bootstrap 3.1 framework and coded with HTML technique. Due to its responsive and retina ready layout, this theme will perfectly scale down on all devices ranging from large desktop screen to small mobile gadgets. WPCLOUD is a creatively designed one page WordPress theme that comes loaded with lots of essential features. Based on WhiteBoard framework, this fluid responsive theme is tested to work well on devices of various screen resolutions. 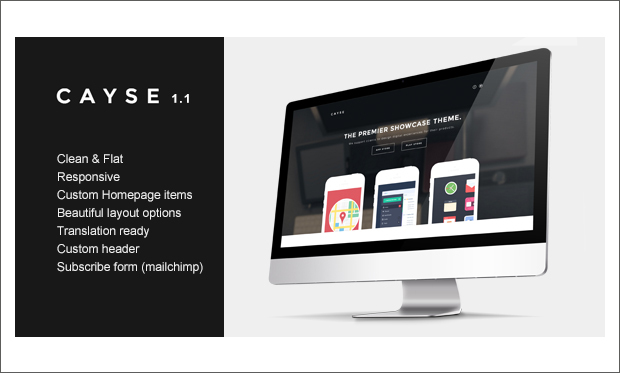 Premium users will be notified with the latest theme updates in their WordPress dashboard. It is SEO ready for optimizing your site on Google, Bing and Yahoo search engines. 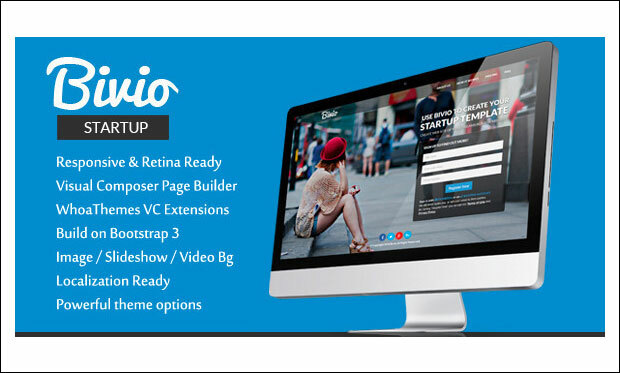 Bivio is an app landing page WordPress theme that is built on twitter bootstrap 3 framework. This ultra responsive theme looks and works perfectly on desktop, tablets and mobile devices. You can create various web pages by dragging and dropping the interface using powerful visual composer page builder. It is compatible with popular browsers such as FireFox, Chrome, Safari, Opera and Internet Explorer. 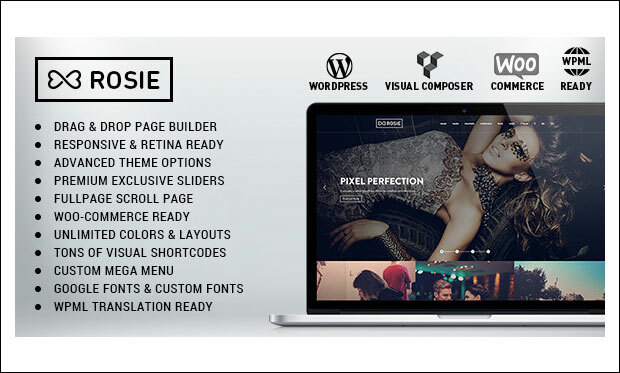 ROSIE is a beautiful multipurpose WordPress theme that comes loaded with a wide range of features to help users with easy creation and customization of the site. This theme can be used for creating product or services landing page websites. It is integrated with WooCommerce plugin for selling items or products online. You can change each and every aspect of the theme by using the built-in Ajax theme options panel. 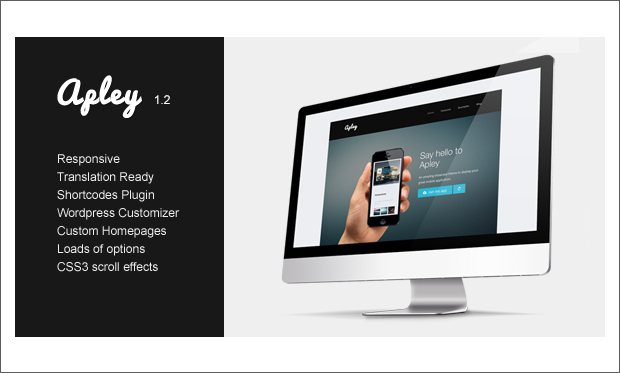 Ethority is a one page eBook landing WordPress theme with a clean and elegant layout. This theme is suitable for selling ebooks by showcasing all the necessary ebook features in one page itself. The theme is well coded and includes detailed documentation to solve the potential queries of users. 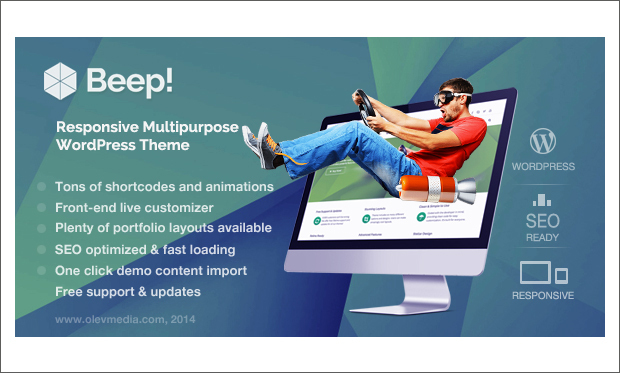 Customize various aspects of the theme by using the advanced theme options panel. Based on the bootstrap framework, Infine is a one page WordPress theme that can be used for creating landing pages, coming soon, conference and camp websites. You can prepare timetable for speakers and showcase when and where it will happen in a clear format. It allows you to create video presentation slides and advertise anything at the right hand side of the website. ANAGLYPH is a one page or multi page WordPress theme featuring a clean and flat design. 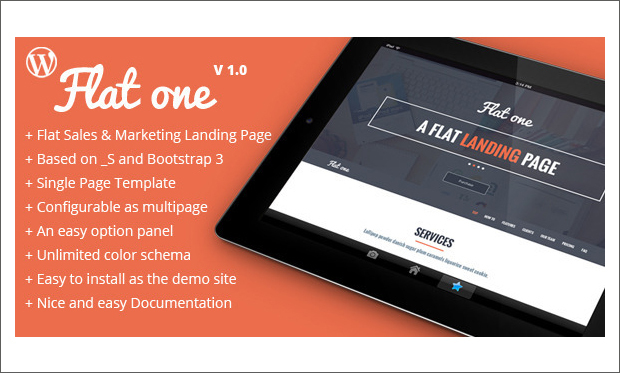 This theme is perfectly designed for building landing pages, agency and portfolio websites. It is designed to provide visitors a rich viewing experience by putting on 3D glasses and to impress them with the theme’s modern three dimensional look of the web pages. Hype is a bold app landing page theme that is compatible with the latest version of WordPress. This theme is mainly designed for creating landing pages for mobile apps. 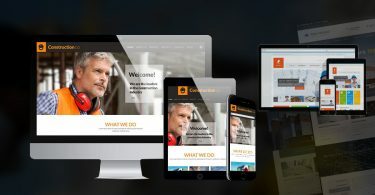 It features a fully responsive design and retina ready to enhance the appearance of the site and make it look sharp on iOS, windows and android devices. 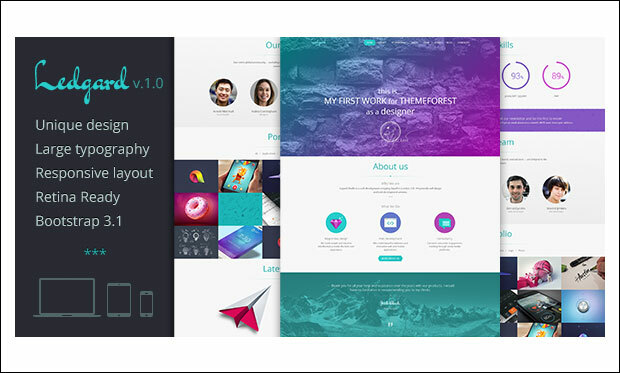 PixelPerfect is a modern landing page WordPress theme mainly designed for mobile apps. It features a responsive and HiDPI retina ready layout for improving the website apperance on all mobile devices. It is Mailchimp ready and includes working contact form and subscribe form. Users can quickly setup the theme and import the demo content in one click. 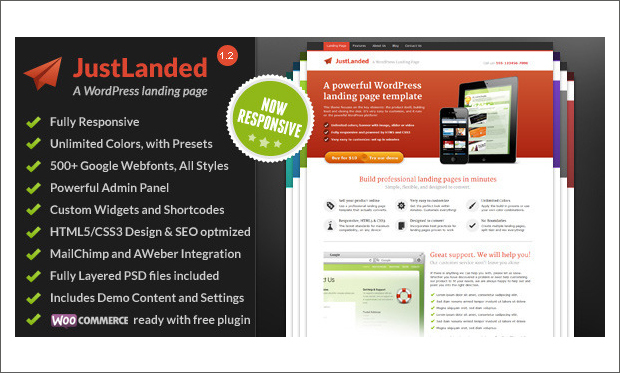 If you are in search of a great landing page WordPress theme, then JustLanded theme would be a perfect choice for you to consider. This theme with highest number of downloads is designed to satisfy the needs of various users. 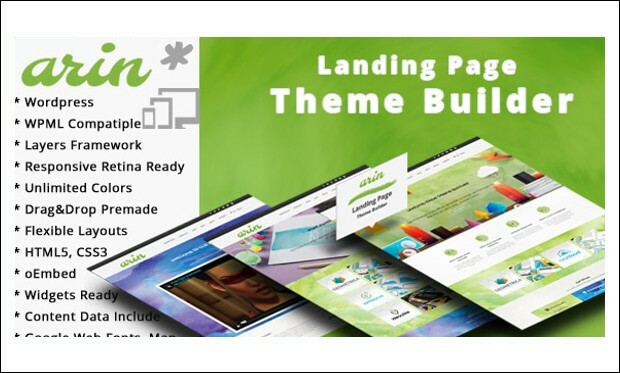 You can easily install and setup the theme for creating multiple landing pages effortlessly. It’s a clean and bold WordPress available at theme forest that allows you to build well designed and professional looking landing pages without having to worry much about the coding part. Purchase this theme that comes at $35 you can avail multiple features like 4 header variations, font awesome icons, Google fonts, parallax sections, unlimited colour schemes and cross browser compatibility. This clean and flat designed WordPress theme ensures your visitors to have a remarkable browsing experience from their laptop, tablets, smartphones, Android and other mobile devices. Due to its easy-to-use controls, you can straight away modify your website immediately after purchasing it. If you face any issue with the theme, then the extensive documentation can come in handy. This modern app landing page WordPress theme features a minimalistic design to let users mainly focus on the apps and other advertising materials without any distraction. 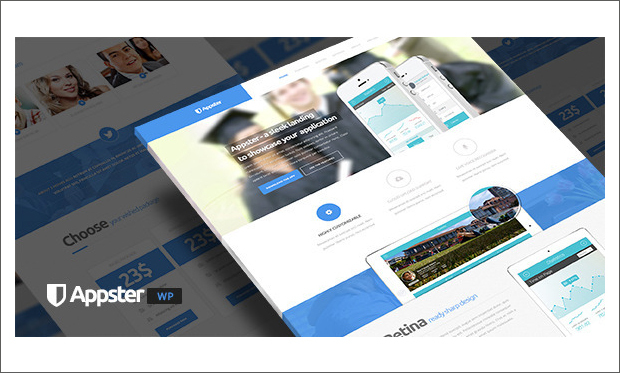 Appster is built with the latest HTML5 and CSS3 technologies and offers multiple customization options to enhance the appearance of your website. It features MailChimp integration, drag and drop content builders and smooth scrolling effects. 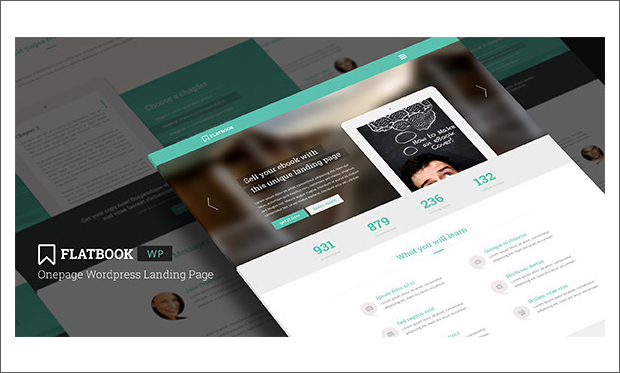 It’s a leads generating WordPress theme with extremely flexible landing page feature. 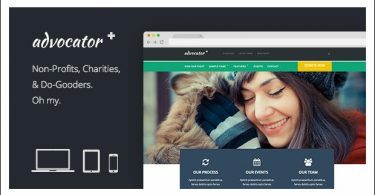 You can choose from unlimited colour options, 350+ font icons, 11 Google fonts and 50+ customization options to give your site a unique look and feel when compared to the competitor sites. If you want to make your site look similar to the one shown in live preview, then you can simply import the demo data in one click. 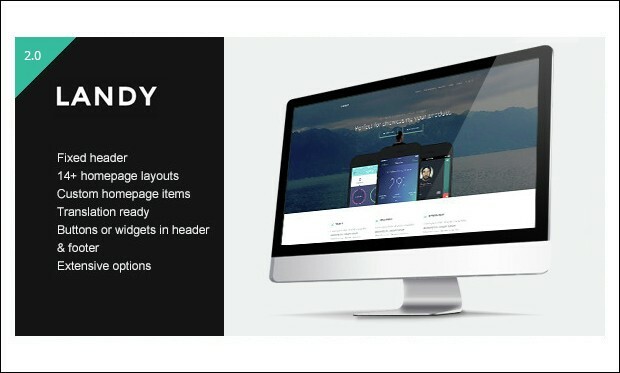 This landing page WordPress theme available at theme forest will make your site look perfect on any screen size be it either a desktop computer, laptop, Mac, tablet, iPhone, iPad or mobile gadget. 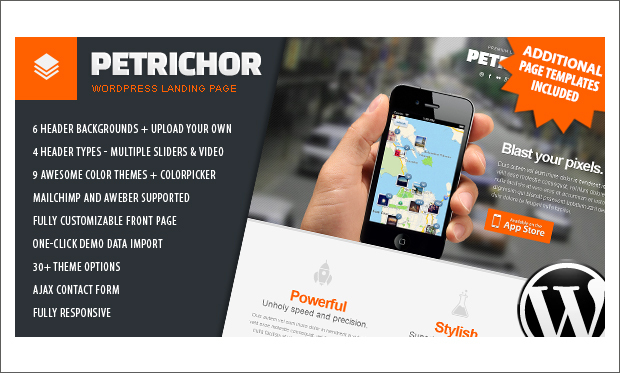 Petrichor is also compatible with the modern web browsers. It is powered by the Twitter bootstrap framework and comes integrated with MailChimp subscription form. 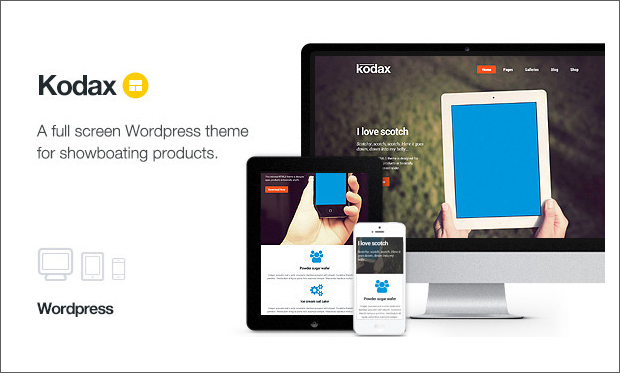 If you want to show off your products or items beautifully then Kodax WordPress theme might be a best solution for you to consider. Kodax is a full screen landing page theme that works great for personal, company, blog and portfolio websites. The theme is SEO optimized to improve your page rank and website visibility on Google, Yahoo and Bing search engines. This responsive landing page WordPress theme allows your site to look great on desktop, Android, Mac, BlackBerry, tablet and mobile devices. The theme also works well across popular web browsers like Google Chrome, Opera, Firefox, Safari and IE. Netix can be translated to any local language as the theme is translation ready. 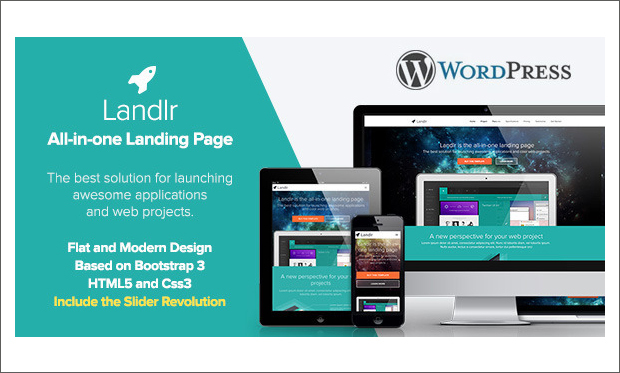 Built with the modern HTML5 and CSS3 technologies, Landlr is a stylish WordPress theme for creating landing pages to show off your web projects, applications or start-up company. The theme allows your viewers to mainly focus on the content due to its flat design. To enhance your website ranking on various search engines, the theme is SEO optimized. 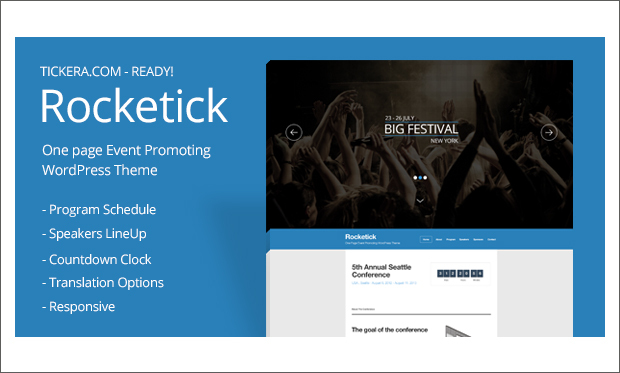 It’s a one page responsive WordPress theme for creating event landing pages to showcase your program schedule, gallery, sponsors, speakers, profiles etc. Due to its responsive design, visitors will have a great viewing experience no matter what kind of a device they use for accessing your site. Make use of the detailed documentation to help you with proper usage of the theme. Apley is clean and awesome WordPress theme for crafting different mobile application landing pages. This theme ensures to grab your visitors attention the minute they stumble on your website. 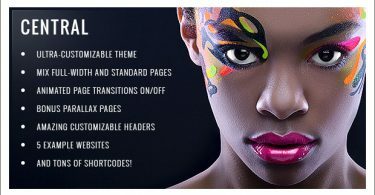 It features built-in customizer to help you with easy customization of the theme to suit your needs. You can add social icons in the footer of your website so that visitors can share the mobile applications on their social profiles. 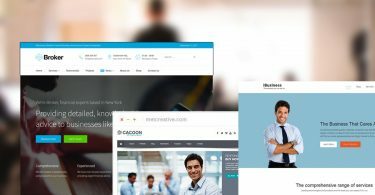 With this bold WordPress theme you can build beautiful landing pages for your corporate or personal website. It features a minimalistic design with contrast style to impress your visitors. Show off your work explicitly by using the full screen slider to setup background videos or images slideshow with landscape or portrait modes. Add Google maps to your site so that visitors can zoom and view your work location. As the name implies, this WordPress theme is designed to attract your customer’s concentration with its clean and responsive layout. It is based on bootstrap framework and be easily customized to solve your requirement. If you encounter any issue while installing and importing the demo content of the theme, then you can check out the multiple video tutorials available in 1080p high definition. Built on the top of the bootstrap 2.3 framework, this multipurpose WordPress theme can be used for creating landing pages with ease. STYLISH theme has been designed by the developers after several hours of hard work invested into it. It offers you endless styling possibilities in order to match your taste and prerequisites. 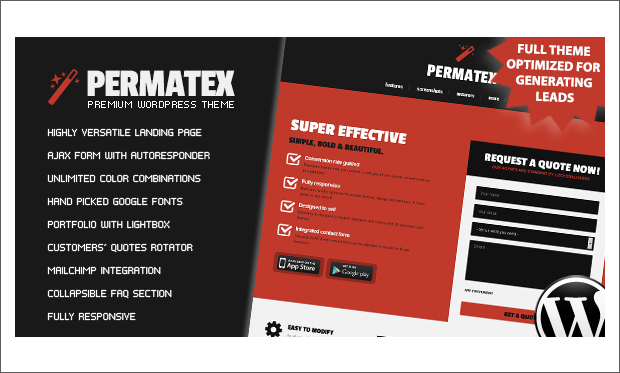 This popular theme is compatible with the latest version of WordPress. If you want to create an exclusive landing page for your ebook selling business then this WordPress theme might be a perfect solution for you. The theme comes up with a minimalist, flat yet trendy and eye-catching design to attract your visitor’s concentration. Import the demo content or utilize the built-in options for setting up the theme within 15 minutes. 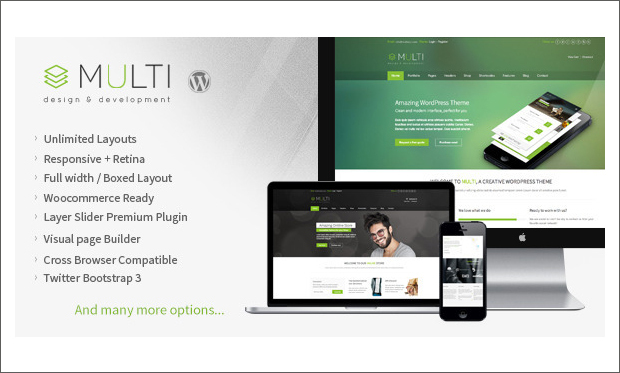 Multi is a modern and multipurpose theme for building any kind of a website. Built with Twitter bootstrap 3 framework, this flexible WordPress theme can be easily customized as it comes packed with tons of features using the unbranded theme options panel. 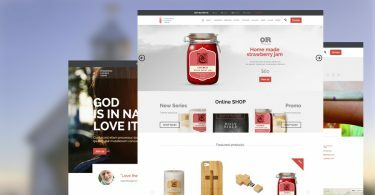 This responsive theme supports WooCommerce, child theme, retina ready and translation ready. Beep WordPress theme allows you to create numerous landing pages without any header, footer or logo. You can turn on or off the responsive mode of this theme. It is SEO optimized to improve your site ranking and to load your web pages faster. The theme is multilingual ready to help you craft a multilingual website. It also supports Right to Left (RTL) languages. BizNex is the latest released WordPress theme with stunning parallax effects and smooth CSS3 transition effects for creating multiple landing pages. The theme is optimized for all mobile devices as well as modern web browsers in order to enhance the appearance of your website and to make it look appealing to your visitor’s eyes. You can integrate different social media profiles like Facebook, Twitter and Google+. 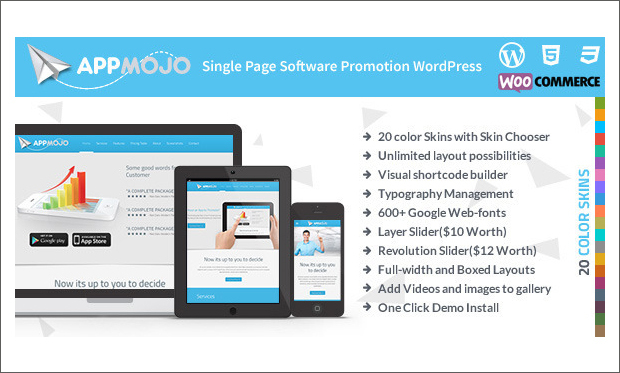 App Mojo WordPress theme from theme forest lets you create your own landing pages with WooCommerce integration. Due to its responsive design visitors can easily access your website without any flaws from their Android, iPhone, iPad, desktop app or Windows mobile app. Purchase this theme that comes at an affordable price and you can avail lots of powerful features that comes along with it. 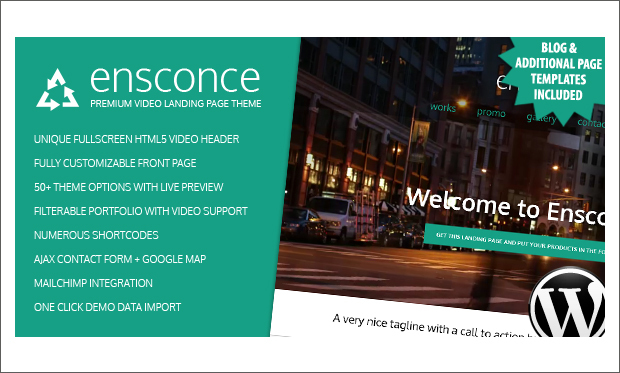 It’s a premium video landing page WordPress theme for your website. The theme features full width HTML5 video header for supporting YouTube and local video files. You can customize the theme by choosing from 50+ theme options with a live preview option. Integrate Google maps to allow visitors easily track your work location.